Northmor’s Conan Becker fights for a takedown in the Division III 145-pound state finals Saturday night. 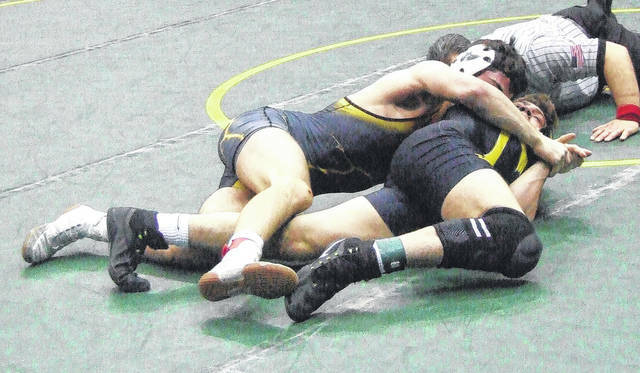 Conor Becker finished third at 152 pound to help Northmor’s wrestling team to a seventh-place finish at the state meet. Aaron Kitts placed sixth at 132 pounds as a senior. 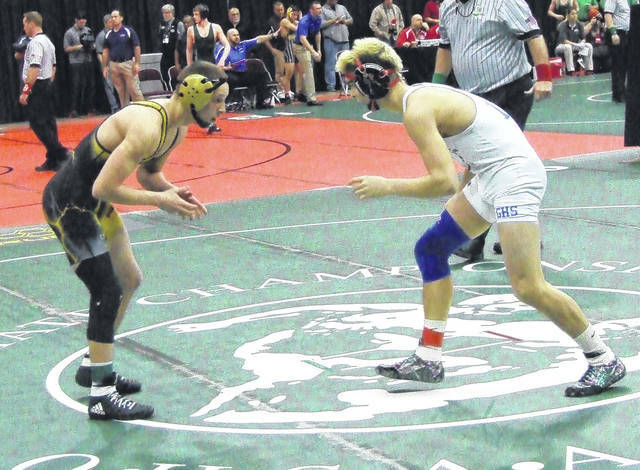 Gavin Ramos capped his sophomore year by placing eighth at the state meet at 126 pounds. While the Northmor wrestling team had a state tournament for the ages, with all four of their competing wrestlers placing in Division III and the team taking seventh place overall, the way it ended left a bad taste in head coach Scott Carr’s mouth. Senior Conan Becker, competing in the championship of the 145-pound weight class, fell by a 3-2 decision to Gavin Grime of Archbold and the head coach was seething about two borderline calls that both went against his wrestler, who took second on Saturday after finishing fifth and sixth at state the past two years. Trailing 1-0 in the match in the second period, Becker was victimized by a close takedown call that put him in a 3-0 hole. In the third period, he narrowed the score to a 3-2 margin on a penalty point against Grime followed by an escape. He then tallied an apparent takedown with 38 seconds left in the match, but the referee decreed that it happened out of bounds. Making matters worse for Carr was how Becker was the more aggressive wrestler throughout the match, regularly attempting shots while Grimes was content to wrestle defensively. Up until the ending, it was a magical tournament for the Knights and Becker, who finished his season with a 53-3 record. In his first two matches, he topped Beau Lefever of Ashland Mapleton by 16-1 technical fall and defeated Chase Sumner of Ada 8-5. In the semifinals, where he’d been defeated in each of the past two years, he was able to outwrestle Logan Kissell of Garrettsville Garfield and take a 6-3 decision. In that match, Becker struggled with a nosebleed for much of the first period, but was able to get a late takedown and was awarded two back points when the ref had to stop action due to Kissell suffering an injury while on his back. With gauze wrapped around his nose, he noted that as the match progressed, it was tough to breathe. Becker’s 53-win season ties him for second place in school history with Jamie Baldridge, who reached that mark in 2014. His brother, Conor, leads in that category after finishing a 54-5 season with a third-place finish at 152 pounds. To place third, he had to win five straight bouts after falling 10-8 to David Cumberledge of Ashtabula St. John in his first match on Thursday. After that loss, Carr noted that his sophomore had what it takes to place third, but needed to be more aggressive, noting that Cumberledge instigated nearly all the offense. Conor spent the rest of the tournament making Carr look like a prophet. On Thursday night, he bounced back with an 8-5 decision over Kerington Martin of Covington. On Friday, he opened with a pin of Dillon Walker of Legacy Christian Academy in 2:51 to clinch a spot on the podium. Conor then defeated Matt Hall of Bethel-Tate 3-2 to close Friday and would advance to the third-place match with a pin over Kyle Rider in 1:47. In that bout against Chase Moore of Swanton, who defeated him in the consolation bracket last year, preventing him from placing, Becker recorded three takedowns and a reversal, while only giving up three escapes in an 8-3 win. Carr was pleased with his wrestler’s improvement from previous year at the state meet. Another wrestler who exorcised some state meet demons was senior Aaron Kitts. After going 0-4 over the last two years at state, Kitts opened Thursday by earning his first state win, topping Tad Jensen of Oak Harbor, who’d beaten him earlier in the year, by a 10-1 margin. Kitts would lose in the next round via pin to Niko Chilson of Rootstown, but bounced back to top Peyton Lane of New Paris National Trail by a 10-4 score before edging Cael Rowland of W. Salem Northwestern 3-2. On Saturday, he would lost 7-1 to Parker Watson of Rocky River Lutheran W. and 10-1 to Chilson to fall to sixth in the 132-pound weight class, but his three state wins allowed him to finish his season with a 40-13 record. Also finishing on the podium was 126-pounder Gavin Ramos (45-13), who took eighth. He opened his tournament by upending Garfield Heights district champion Seth Majewski of Brooklyn by a 5-2 margin. Ramos lost his first match on Friday by a 5-2 margin against Devan Hendricks of Jamestown Greeneview, but earned his spot on the podium by defeating Ethin Hoffman of Arcanum in his first match Friday. A pinfall loss to Logan Hursey of Newcomerstown later that day bumped him down to the seventh-place bout Saturday, which he lost by an 8-6 margin to Dakota Blanton of Ashland Crestview. While disappointed in how Conan Becker’s career ended, Carr was pleased with how his team performed over the three-day meet, especially after only having one place-winner among seven state competitors last year. And with two of those four state wrestlers coming back, Carr is hoping that trend continues.